Kerala has been on high alert due to mysterious deaths of eight people because of an unidentified viral attack. Out of these, three were reported to be caused by Nipah Virus (NiV). As per the National Institute of Virology, Pune, Nipah Virus is the sole cause of these three deaths. Rajiv Sadanandan, Kerala’s health secretary, has assured that the government has started its preparation towards fewer deaths and that people should not panic. An unheard virus, NiV is yet to be understood by many. Here is what Nipah virus is all about! 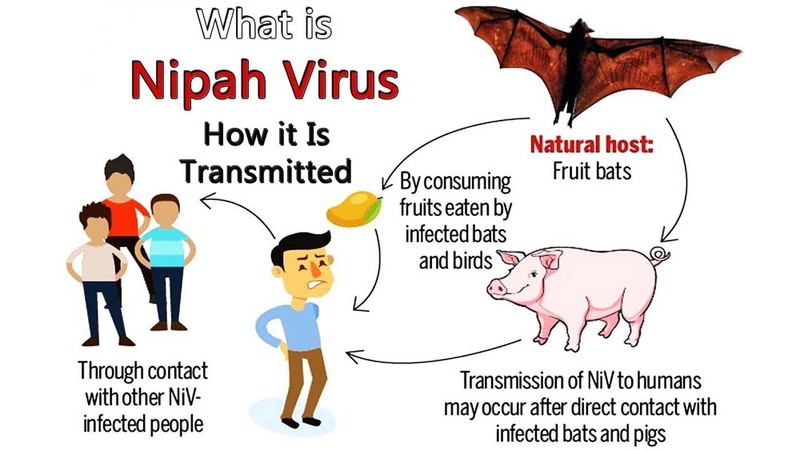 What is Nipah Virus? Causes of Nipah Virus. Signs and Symptoms of Nipah Virus. PRevention and cure of Nipah Virus. As per the World Health Organisation (WHO), Nipah Virus is a newly emerging zoonosis that causes a severe disease in both animals and humans. This virus was first identified in Malaysia and Singapore in 1998. At that time, it was primarily caused in pigs and through them got transferred to humans. Nipah Virus infected as many as 265 people then, out of which 40 per cent were taken under intensive care due to the infection having spread severely. As quoted by the WHO, the natural host of the virus are fruit bats of the Pteropodidae Family, Pteropus genus. The virus can be transferred through infected bats, pigs or humans who have been infected. In 2004, humans who consumed the date palm sap infected by fruit bats, caught the virus as well. Humans who were infected by other humans were reported in Bangladesh and India. Nipah Virus is usually associated with inflammation of the brain due to which severe days of fever can often lead to a state of confusion, disorientation and even persistent drowsiness. If not taken care of, these symptoms can even cause a coma in a span of 24-48 hours. There are many patients who show neurological, respiratory and pulmonary signs as well. Therefore, do not ignore any such signs. The symptoms may take from four to 14 days to appear after a person gets infected. The early symptoms are not very clear and can easily be confused with that of viral fever and common cold. The virus can kill between 40 per cent to 100 per cent of those infected by it. And you will be surprised to know more than 60 per cent of this infection in humans comes from animals. As of now, there is no particular vaccine available purely for the treatment of Nipah Virus. The only way to treat this virus is through intensive supportive care. Since drinking raw date palm sap bitten by a bat can also cause NiV, it is safe to say that you should stay from consuming date palm for some time. Hospitals also need to raise awareness about symptoms and transmission to avoid human-to-human infections in such settings. Detection is another issue with NiV and anyone who feels the symptoms should get tested thoroughly from a recognized facility. Know about Nipah Virus Causes of Nipah Virus. Signs and Symptoms of Nipah Virus. PRevention and cure of Nipah Virus.Kerala has been on high alert due to mysterious deaths of eight people because of an unidentified viral attack.